The Maple Run Tour is a ‘sweet’ reason to Wander to Pakenham, just a short drive west from Ottawa via Hwy 417 or from Arnprior and Carleton Place via Hwy 29. 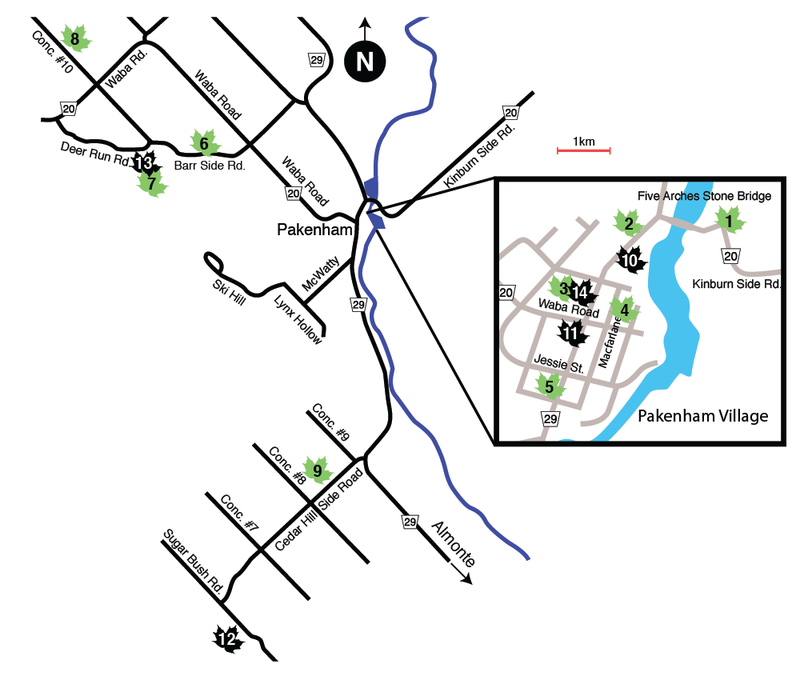 Once you’ve arrived, continue to wander along all 10 stops on the tour route in and around Pakenham. Brochures with tour information can be downloaded here, picked up at the Pakenham General Store (right in the heart of the village) or at any tour stop displaying the green maple leaf logo. Experience inspiring art, craft, food and heritage locations. Meet the artists, delight in their fresh artistic expressions, out what feeds their passion. The 2019 Maple Run Tour features both returning artists as well as 5 new participants. The artists hail from both near and far – from Pakenham and area, Arnprior, Perth, Ottawa, across eastern Ontario, West Quebec, up the Valley, and beyond. Each brings their own unique artistic expression: pottery for inside your home and outside too, delightful birdhouses, glass both blown and stained, photography, jewelery for any mood or outfit, pewterware, artistic blacksmithing, garden sculptures, miniature quilts and meticulously sewn fabric items, luscious soaps and candles, honey and jam products, award-winning children’s literature, beautiful weaving, and even handmade custom clothing. Experience it all, in a day or over the weekend. Indulge yourself in a new art treasure, or in locally produced fudge, artisanal coffee, craft beer (some of it brewed with maple sap!) and locally produced cider. It’s a perfect time to enjoy Lanark County’s maple syrup season (www.mapleweekend.ca) with a visit to Fulton’s Pancake House and Sugar Bush ( www.fultons.ca) . Try out the local restaurants and bakeries, many who have maple inspired food items for this annual spring celebration. The Maple Run Tour website gives a detailed description of all 33 participants, 10 tour venues, food stops, demonstrations, special events and a map with locations taking you through Pakenham and surrounding area. www.mapleruntour.com. Brochures with tour information can be picked up at the Pakenham General Store (right in the heart of the village) or drop by at any tour stop displaying the green maple leaf logo. Include in your day a visit to St. Peter’s Celestine’s Church (guided tour on Saturday and Sunday at 1:30 p.m., donations appreciated). 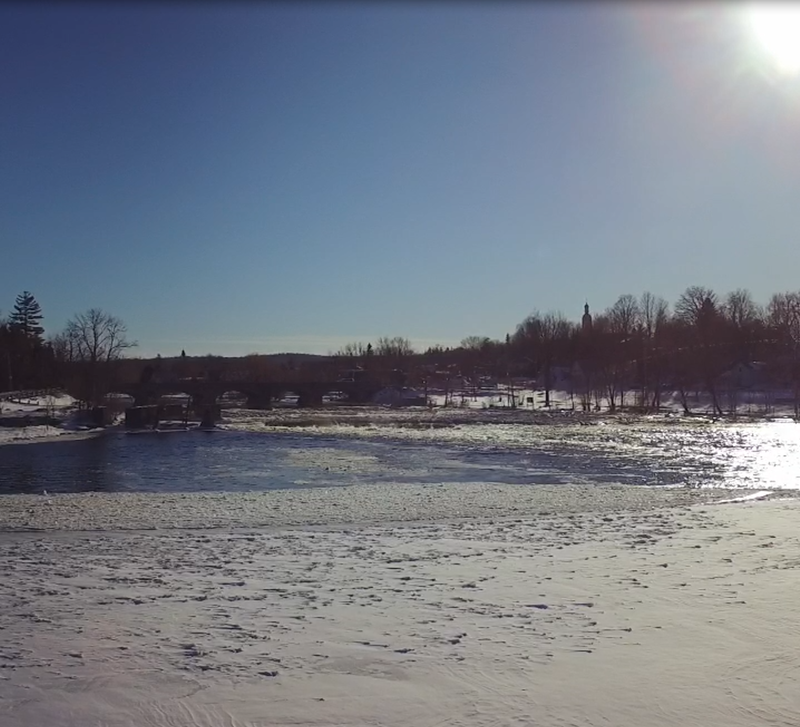 Take photos at the only surviving 5 stone arched bridge in North America, which at this time of year will have a spectacular vista of the Mississippi River’s spring run off. And check out the Pakenham General Store and its impressive stone building – it has been in business since the 1840s and is the longest continuously running general store in North America. All the details can be found at www.mapleruntour.com and find us on Facebook for updates and more.